Recently we went through a phase of really missing home made Vietnamese comfort food so we made ca kho to (braised catfish in clay pot), and thit kho (Vietnamese braised pork–recipe soon), banh mi, but another one of our favorite Vietnamese comfort food is stuffed tomatoes, ca chua nhoi thit. This is one of my family favorite dishes of my Aunt nine who taught me her recipe. Stuffed tomatoes is rarely found in Vietnamese restaurants but pretty common in family dinners. The sweet juices of the tomatoes and the stuffing make this a really tasty dish with rice. 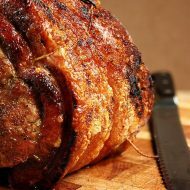 The pork stuffing recipe is very popular in Vietnamese cuisine and can also be used as a base for making eggrolls, cha trung hap in com tam (pork/egg custard in broken rice dishes), and for stuffing tofu, bell peppers, game hens, catfish, and bitter melon. My Aunt’s recipe calls for sectioning the tomatoes horizontally in half and coring out the inside. Set aside. If you cut the tomato at the top, there’s alot of stuff that may cook unevenly and take a long time. By cutting it in half, you’re able to use both halves and the smaller amount of stuffing results in shorter and even cooking. Save the cored tomatoes for the sauce. 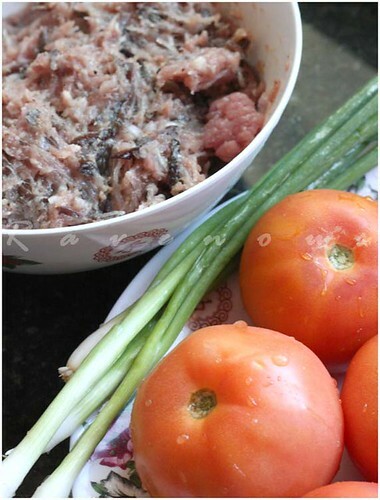 In a large mixing bowl, mix together the pork, fish sauce, sugar, pepper, salt, shallots, wood ear mushrooms, bean thread noodles. Now you’re ready to stuff the tomatoes. Stuff just to the top of the tomotoes, leaving a flat surface for even cooking. In a large sautee pan, heat cooking oil and garlic on medium high heat. Add the stuffed tomatoes with the stuffing side down first. Also add the cored tomatoes around as well. Cook until the meat is nicely golden brown and flip once. The cored tomatoes will also soften and turn in beautiful sauce. If you like more sauce, supplement with your favorite brand of canned tomato sauce. Season with fish sauce or salt and pepper to taste. Garnish with thinly diced green onions. Enjoy as an appetizer or with rice. yum! and look at all those wonderful tomatoey meaty juices….very appetizing! 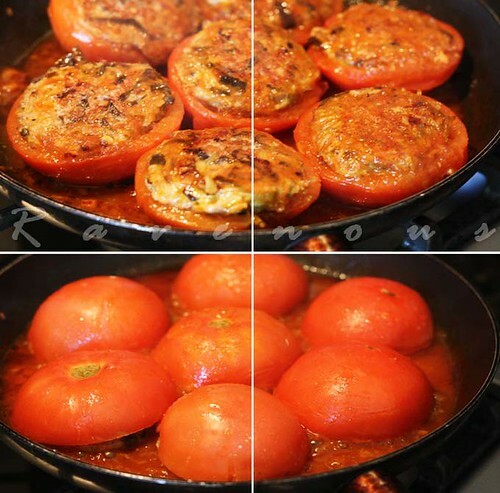 rita: stuffed tomatoes are nothing fancy, but they are sure tasty! diva: ca chua nhoi thit is also awesome with lots of rice! 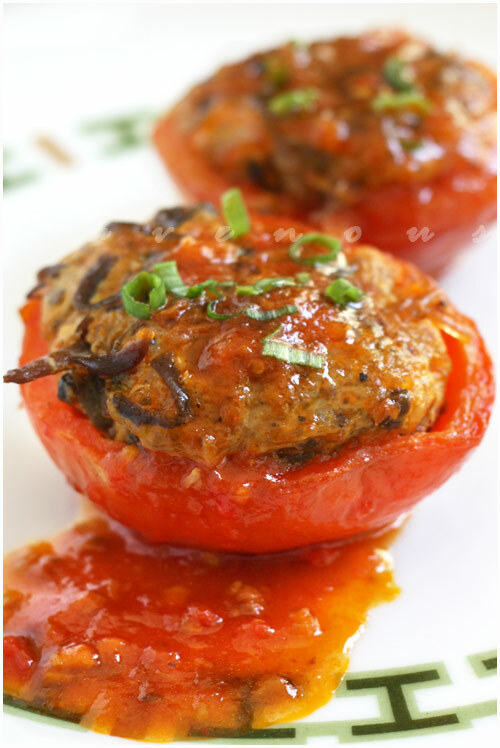 jackie: these stuffed tomato beauties were definitly paired with a lot of steaming white rice! Love your blog! Just moved to west Texas far away from mom's cooking and any Vietnamese civilization so now I'm forced to learn to cook. This is one of my mom's comfort foods. Can't wait to do this myself. I'll be sure to check out your other recipes whenever I get homesick. Anon: hey, that's how we started cooking too! Plus, cooking your mom's recipes such as stuffed tomatoes are a great way to share and keep in touch. sputnik: ca chua nhoi thit combines alot of tasty flavors. Let us know if you try it! I've loved this kind of stuffed tomatoes since childhood, so this brings back a lot of good memories! Your pictures are always gorgeous! Thanks for sharing this recipe. french accent: we're glad ca chua nhoi thit brings back good memories for you–that's why we love it as comfort food. Hi Ravenous Couple, thank you for leaving your footprint on my blog as I'm really glad that I found yours too. You have so many wonderful Vietnamese recipes and I'm really keen to learn and try out some. This stuffed tomatoes truly look so succulent! Thanks for posting this recipe & pics. Looking at the beautiful pics bring back a lot of childhood memories. My mom used to made these and they are so good when eaten with rice. I need to make some to create the same lasting comforting memories for my kiddos. petite nyonya: ca chua nhoi thit is really great with the juicy tomatoes and savory pork, mushrooms and glass noodles. 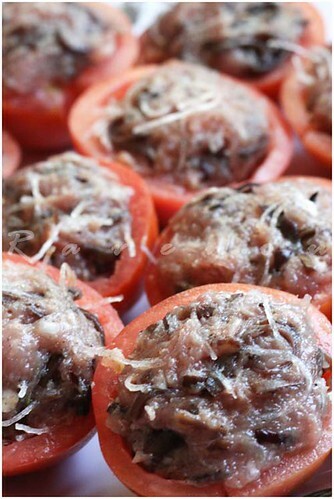 Mai: Stuffed tomatoes is feel good dish! Let us know how it goes for you. Felicia: Thank you so much for letting us know how this turned out. So glad you enjoyed ca chua nhoi thit! It's a great base to make other things such as egg rolls and other dishes. Thanks for this easy recipe! It took me an hour since I'm slow with chopping and scooping, but I made 16 of these for an Easter potluck and they were gone quickly. Look forward to more of your recipes! 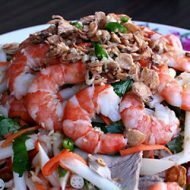 Thanks so much for putting up this recipe, ever since I've moved to the otherside of Australia away from home I've been inspired to feverishly build up my viet cooking reportoire.. I cant believe I forgot the existence of this dish and how much it comforted me when my mom cooked it once in a blue moon!! What do you guys think of adding pineapple? Every once in a while, just thinking about a particular dish brings home so many smells, tastes and emotions of a bygone time.. and for me this is definitely one of them! Andrew: thanks for sharing your experiences..let us know if you make it and how it turns out! Thank you so much for sharing this recipe! My mum used to make this quite frequently when I was growing up and I agree with your description of it as Vietnamese comfort food. I couldn't wait to try your recipe and made it last night and, oh my gosh, it was just beautiful!! So delicious!! My husband and I didn't think we would finish 8 stuffed tomato halves between us, but we did! I added some finely chopped carrots to the mince mixture for extra sweetness. I don't remember my mum serving the stuffed tomatoes with a sauce but your idea of adding the cored tomatoes was really lovely. I can't wait to make this again! reading this reminded me of the days my late grandma would make this for the family for dinner. I seriously wished that I was a bit older to know better and learned her cooking ways, but I'm glad you guys are keeping the Vietnamese culinary cooking going. It's so good flavorful and good for you (in moderation of course). Thanks for the recipe! I made this for dinner tonight. My stuffed tomatoes does not look as good as yours, but it was delicious. This was a great success tonight! The family loved it! All of my tomatoes did not turn out at pretty as yours…….but it was Delicious all the same!… Thank You! My partner is Vietnamese and for years we have made a dish that his family (from North Vietnam) calls “Faci Ca Chua” (Sorry – don’t have the ability or knowledge of how to properly punctuate, and this is spelled phonetically). Have you ever heard this term used for this dish? Your recipe seems to be nearly exactly the same recipe. Same recipe? or something slightly different? Any thoughts? Just curious. Delicious meal though and I am about to make it this very moment for dinner tonight as a surprise for my husband-like companion. 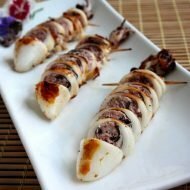 Thank you so much for your Vietnamese recipes! Since my dad passed away, I’ve been trying to cope by cooking his famous dishes. Your recipes are the closest to his own. Thank you for sharing them.